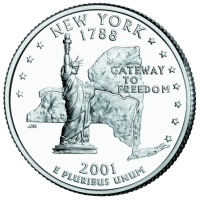 The New York State Quarter was the first state quarter issued in 2001 and the eleventh in the series which was authorized by the 50 States Commemorative Coin Program Act. 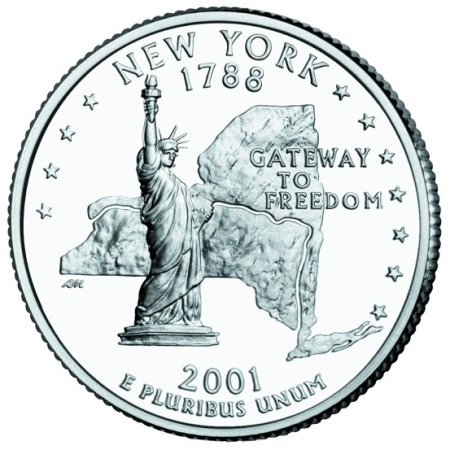 The release date for the NY State Quarter was January 2, 2001 and the theme chosen for the design was Gateway to Freedom. The route of the Hudson River and the Erie Canal are also highlighted on the outline of the state to represent the vital developmental role of these waterways. The Gateway to Freedom theme was chosed because New York is the entry point for millions of people who come to America seeking political freedom and democracy. The governor of New York encouraged residents of the state to submit design ideas for the New York State Quarter and hundreds of people from school children to history buffs to graphic artists and coin collectors from all across the state submitted design concepts. A rendering of the historic painting, "Battle of Saratoga"
New Yorkers were then asked to vote for their favorite design and the Statue of Liberty design received 76% of the votes. It was then officially selected by the Governor as the new design for the NY State Quarter. Below is a table showing the design specifications and mintages of the New York State Quarter. Note: The modification moved some of the wording from the reverse to the obverse to leave the reverse available for the state's design. Reverse - Each state theme was proposed, and approved, by the governor of the state. Final design was created by Alfred Maletsky. His initials appear on the left side of the coin just below the outline of the state.